A: Coffee News® is strategically located wherever people are eating, grabbing a cup of coffee, or waiting for service. Look for us in locations throughout the local areas. Some of our locations are restaurants, delis, coffee houses, etc. The remaining 30% are distributed to places where people are known to wait or frequent regularly such as hair salons, doctors offices, dry cleaners, community & senior citizen centers, and town government offices. We also deliver to the airport, regional hospital, and hotels. A: New issues are published weekly. For a current list of our distribution locations, please click on the DISTRIBUTION link here or above. A: No. The Coffee News is exclusive to all of our advertisers. Only one business per category can advertise with us at any given time. As a courtesy to all our restaurant and coffee shop distribution locations, we offer the protection that no business in the restaurant industry will be allowed to advertise in Coffee News®. Although most restaurants would love to have an ad,they are disallowed automatically. The reason — a Burger King ad in Coffee News®, for example, would have every McDonald’s refusing to carry Coffee News®. No restaurant would welcome their competitor’s efforts to take away their customers right inside their own premises, so they would naturally kick them out — and Coffee News® too. 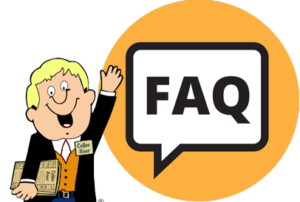 A: Ads in Coffee News® are less expensive than other repetitive print media so that the small business person can easily afford to advertise. 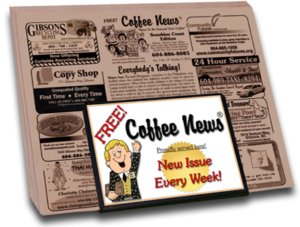 You can advertise in Coffee News® for a fraction of the cost of other media! Remember all ads in Coffee News® are “EXCLUSIVE”, meaning we only allow one type of business in each edition, allowing our advertisers to LOCK OUT their competition! Contact us to request current advertising rates. Q: Why do you recommend that the ad run for at least 13 weeks? A: Studies have proven that most readers need to see an ad at least 8 times before they are able to remember or “absorb” the message. Many readers do not actually need your product or service at the time they see your ad. It is to our advertisers benefit that their ad is out on our stands and distributed for the public to read for as long as possible. 13 weeks is the minimum length that we recommend. Advertisers that sign on for even longer plans will receive a better response & results from their ad, due to the long term trust & familiarity their ad creates with our readers. A good ad is like a seed for a fruit tree. Repetition is its water. Weekly consistency is its sunlight. The longer your seed is allowed to grow in the mind of the Public, the greater and greater your harvests will be. What size harvests do you want to see? A: We accept credit card, cash or cheque. Billing can also be monthly or in installments or annually – depending on the plan you choose. A: No, all ads are designed by a professional graphic artist to insure the most effective impact on the readers. You only provide your logo if desired, and the information that you would like included. For businesses that wish to provide their own pre-designed ad, the ad specs are 2 inches high x 3 inches wide. Black & White. Minimum 300 dpi pdf file with all fonts & graphics embedded is required. Do not place a border around the ad as we use our own border template. Please provide the ad in both pdf and jpg formats for use in both print and online.